Greetings from Makerere University School of Public Health ResilientAfrica Network (RAN) www.ranlab.org. In partnership with UN WOMEN, ResilientAfrica Network (RAN) is implementing a project on equipping communities in Northern Uganda (Gulu and Kitgum Districts) and partners with skills directed towards the use of innovative approaches in Ending Violence Against Women and Girls (EVAWG). 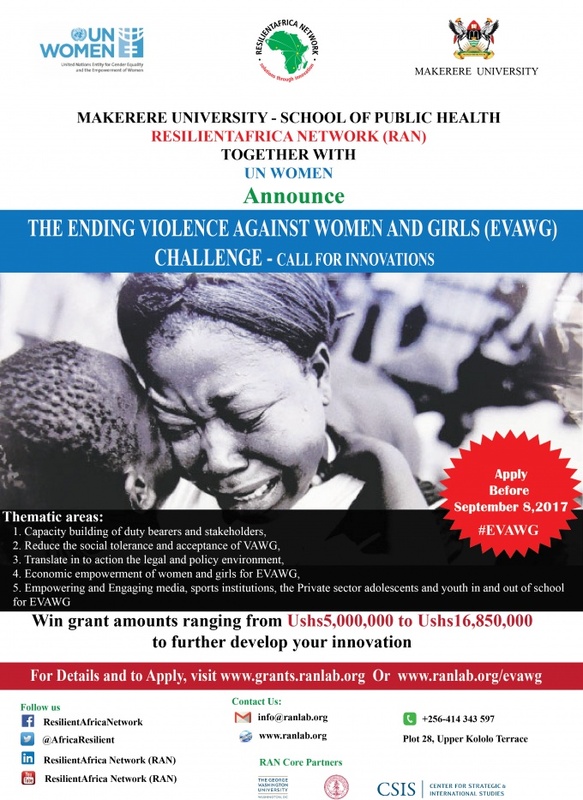 This EVAWG challenge seeks to identify innovative solutions towards ending violence against women and girls. These can be initiatives or approaches with proof of sustainability and scalability starting with communities in Northern Uganda. Do you have an innovative, demonstrable solution, or approach that has the potential to improve the legal and policy environment and social systems in families, communities where violence against women and girls is prevalent? Are you or your organization already implementing an intervention that addresses issues of violence against women and girls? Do you have an idea that innovatively addresses either the vulnerability factors or builds on the adaptive strategies of the affected communities? If so, please fill in the application template and let us further build these innovative solutions together for community transformation. Also attached is the poster to help in further spreading the word.